Jack had to send a thank you card to a dear friend who always remembers him on holidays and special events. She's the best! 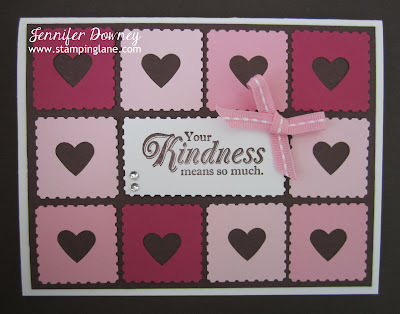 He helped me use the Small Heart and Postage Stamp punches to create this sweet card. Colors used were Rose Red, Pretty in Pink, Pink Piourette, Whisper White and Early Espresso. What did he do with all the punched out hearts? He put them inside the card for confetti! Hope she didn't mind all the "love pouring out" when she opened the card! It was Jack's idea! Honest. Happy Stamping!